Pies, y’all. Wannabe Whoppie Pies. But that’s not what I started out to make. Nope, not in the least. I set out to make a Retro Recipe for Vanilla Wafers. I’ll admit that maybe my attention was spread a little too thin. I had orange chicken going in the kitchen, was stumbling my way through a sewing project in the dining room, and really wasn’t paying attention to Vanilla Wafers. I creamed the butter with half of the sugar called for and didn’t realize it until all the eggs and half the flour and milk had already been added. I then spent a good five minutes trying to figure out which would be a worse way to break the recipe – by having not enough sugar or by adding more sugar too late in the process. I decided to gamble and see what would happen if I added the rest of the sugar along with the flour. To say that what I pulled out of the oven was not what I was expecting would be an understatement. Let me back up a moment. These Retro Recipes, unlike many modern recipes, don’t come with description of the final product. And there are no pictures. So I read Vanilla Wafer and in my mind I saw little Nilla Wafers. And I began to set my expectations of how my work creaming and blending and mixing was going to pay off. I started imagining bite sized cookies, crunchy, redolent with vanilla, that are perfect eaten by the handful adorned only with a glass of cold milk. What I should have imagined were flat, cake like rounds. Even Merriam-Webster knows that one definition of a wafer is a thin, crisp, cake. Mine most definitely satisfied two of those descriptions. And the edges were rather crisp. So I suppose I should fault my expectations, and probably my process, because what I got does technically meet the definition of a vanilla wafer. It just wasn’t a nilla wafer. My bad. After assessing the situation, I couldn’t decide whether to bake off the rest of the batter or not. On the one hand, I was expecting one thing and got another. On the other hand, what I got wasn’t so bad. You know how you get scraps and thin slices when you level off the top of a cake? That’s what these were like. And as nice as that was, I couldn’t decide. So I left the decision up to The Mistah who enthusiastically gestured his thumbs up as he stuffed Vanilla Wafers in his mouth. How could I argue with that? I couldn’t. But then after I ate a few more of these cookies, I started thinking that they need a little something. A sauce. Or a frosting. Or a filling. And when I remembered that I bought a container of marshmallows because I needed 12…well, you can see how it was only a hop, skip, and jump from Vanilla Wafers to Wannabe Whoppie Pies. As The Mistah and I bit into toasty, melted marshmallow sandwiched between moist, cakey wafers I declared that I was freaking awesome. I think you just might too when you try these. BAH Note: I do plan to go back and make the Vanilla Wafers again, closely following the directions, to get an accurate sense of what they’re really supposed to be. While the recipe states a yield of 5 dozen cookies, this attempt yielded maybe two dozen. I stored them on a plate covered with plastic wrap and noticed that they were going stale after only two days. So assuming that they really are supposed to be thin, cakey rounds, I’d recommend not letting them sit around too long. 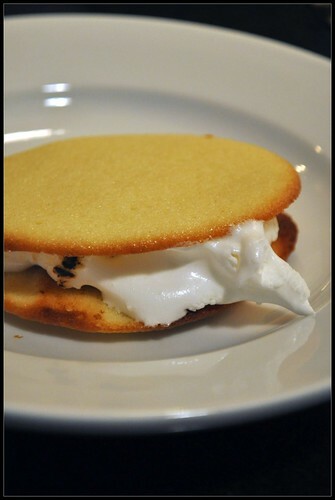 These Wannabe Whoopie Pies would be fun to serve after a casual dinner party (just be sure your marshmallow toaster isn’t already toasted him/herself because cleaning up burnt marshmallow off the stove is no way to end an evening). BAH Tip: I used a burner on my gas stove top to melt the marshmallow. Don’t have a gas stove? Further tests revealed that I could get similar results by microwaving a full size marshmallow for 8 to 10 seconds on 30% power. It won’t brown up but it will get warm and melty. As soon as you see the marshmallow begin to puff up, regardless of how much time is left, pull it out of the microwave and carefully transfer it from the plate onto the cookies with a spoon. Heat the oven to 400 degrees. Line two sheet pans with parchment paper and set aside. In the bowl of a stand mixer fitted with the paddle attachment, cream the butter until soft. Gradually add the sugar and blend well. Add the eggs, one at a time, blending thoroughly after each. Add the flour and milk in two or three additions, beginning and ending with the flour. Using a small ice cream scoop, drop six portions of dough on a cookie sheet. Space the dough so that there is about two inches between each portion. Bake for 10 minutes until the edges turn golden brown. Cool on the pan for 5 minutes then transfer the cookies to a rack to cool completely. Repeat with remaining dough, baking one pan at a time. When ready to assemble the Pies, place two cookies face down on a plate. Place a marshmallow on the end of a bamboo skewer and carefully toast it over a gas stove top burner. When the marshmallow is toasted, place it on top of one cookie. Top with the second cookie and carefully remove the skewer from the marshmallow. When I read “vanilla wafers” in the first paragraph, I also thought of Nilla Wafers first! These look great. I like the idea of stuffing them with toasted marshmallows, kind of like a smores without the chocolate. Yum! Jen, glad I’m not the only one who made a Nilla Wafers assumption. Guess the marketing folks at Nabisco have done their job quite well. If you just happened to have some finely grated chocolate hanging around, or ran a block of Scharffenberger dark over a microplane a couple of time, I bet a quick sprinkle of that on top of the marshmallow before you sandwich the cookies back together would be splendid. Smiled at the title of this post. You naughty thing! These look delicious! Kitch, it felt so Bob Eubanks and Newlywed game but whatever. Not only are these delicious, but I could totally see those little helpers of yours having fun with the marshmallows (under proper parental supervision, of course) and sandwiching the cookies together. I know you may not have a single “sweets” gene in you but surely someone in your house would love these. These look good! And I like the idea of a softer cookie in a sandwich. Less mess. I’m thinking a layer of melted dark chocolate would make these sublime! Kristin, I couldn’t agree more. I hope you’ll give these a try. Hiya Emily. I am hoping someone will try making these and add a little chocolate.